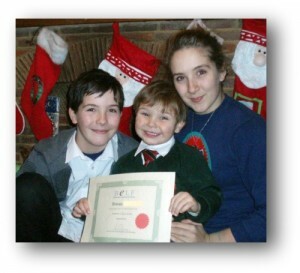 Rowan with his brother and sister, showing us his certificate. Yesterday I visited a lovely little boy who had been waiting for a while to claim his gift voucher and certificate for his entry in our 2011 competition. 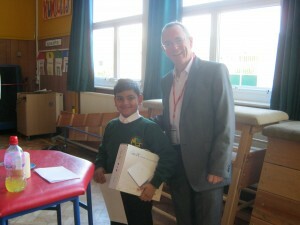 Rowan was too young to enter but the judges were very impressed with the story he had written with the help of his mother. He did want a computer so he didn’t have to wait for his sister or brother (seen in the picture) to finish their work before he could get online to ‘watch Scooby Doo’, or to do numbers and alphabet work. 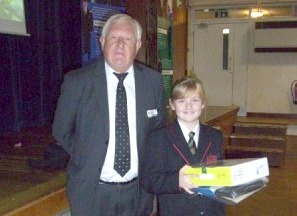 Rowan also wrote that the main reason he wanted a laptop was so ‘I can be a big boy like Daddy and do real work on it‘. Rowan was under four when he entered the competition with the help of his mother.